Joseph is sold by his brothers. AFTER JACOB CAMEback to the land of Canaan with his eleven sons, another son was born to him, the second child of his wife Rachel, whom Jacob loved so well. But soon after the baby came, his mother Rachel died, and Jacob was filled with sorrow. Even to this day you can see the place where Rachel was buried, on the road between Jerusalem and Bethlehem. Jacob named the child whom Rachel left, Benjamin; and now Jacob had twelve sons. Most of them were grown-up men; but Joseph was a boy seventeen years old, and his brother Benjamin was almost a baby. Of all his children, Jacob loved Joseph the best, because he was Rachel’s child; because he was so much younger than most of his brothers; and because he was good, and faithful, and thoughtful. Jacob gave to Joseph a robe or coat of bright colors, made somewhat like a long cloak with wide sleeves. 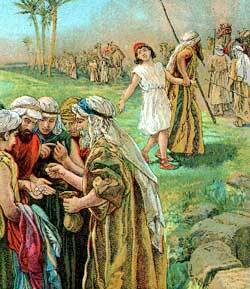 This was a special mark of Jacob’s favor to Joseph, and it made his older brothers envious of him. His brothers hated Joseph, and would not speak kindly to him; but his father thought much of what Joseph had said. That was quite an errand, for a boy to go alone over the country, and find his way, for fifty miles, and then walk home again. But Joseph was a boy who could take care of him-self, and could be trusted; so he went forth on his journey, walking northward over the mountains, past Bethlehem, and Jerusalem, and Bethel — though we are not sure those cities were then built, except Jerusalem, which was already a strong city. And the man said, “They are at Dothan; or I heard them say that they were going there. Then Joseph walked over the hills to Dothan, which was fifteen miles further. And his brothers saw him afar off coming toward them. They Walking knew him by his bright garment; and one said to another: “Look, that dreamer is coming! Come, let us kill him, and throw his body into a pit, and tell his father that some wild beast has eaten him; and then we will see what becomes of his dreams. But Reuben intended, after they had gone away, to lift Joseph out of the pit, and take him home to his father. The brothers did as Reuben told them; they threw Joseph into the pit, which was empty. He cried, and begged them to save him; but they would not. They calmly sat down to eat their dinner on the grass, while their brother was calling to them from the pit. After the dinner, Reuben chanced to go to another part of the field; so that he was not at hand when a company of men passed by with their camels, going from Gilead, on the east of the river Jordan, to Egypt, to sell spices and fragrant gum from trees to the Egyptians. His brothers agreed with him; so they stopped the men who were passing, and drew up Joseph from the pit, and for twenty pieces of silver they sold Joseph to these men; and they took him away with them down to Egypt. So the old man sorrowed for his son Joseph; and all the time his wicked brothers knew that Joseph was not dead; but they would not tell their father the dreadful deed they had done to their brother, in selling him as a slave.